Leaking lung qi, cough, asthma, spontaneous sweating, excessive loss of body fluids, chronic diarrhea, early morning diarrhea, spermatorrhea, nocturnal emissions, urinary incontinence, yin deficiency, blood deficiency, palpitations, anxiety, insomnia and dream disturbed sleep are some of the imbalances satisfied clients have used this product for. Two rare cases of adverse reactions associated with Wu Wei Zi have been reported. following ingestion of an herbal decoction containing We Wei Zi, one case reported palpitations, shortness of breath, chest congestion, increased heart rate and pre-ventricular contraction. and case two reported respiratory suppression. 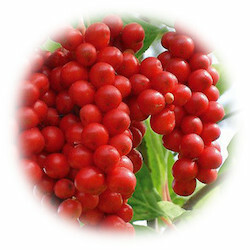 Each package contains 500 grams whole sun-dried Organic Schizandra Berries.